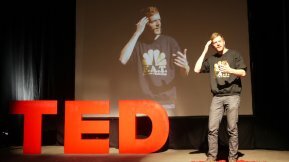 TED Talks have saturated the universe, but just who is this Ted guy, and why in the world would anybody want to listen to a guy named Ted, talk? Seems like everyone is chirping about TED these days and all the talking he’s been doing. TED (technology, entertainment and design) Talks are all the buzz, whether you want to know about the latest fashion, solve world hunger or discover how to build a better mousetrap, there’s’ a TED Talk that tells you how. TED, our friends at Wikipedia tell us, was started as a one-off event in 1984, but things really got hopping in 2006 when the TED Talks were first offered online free of charge. These days, you can’t turn around without somebody throwing a TED Talk reference in your face. TED Talks are pithy, well-rehearsed speeches that cover as much new ground as possible in a short (18 minutes or less) amount of time. The invited speakers must approach things in a novel manner and aren’t allowed to just kick some familiar can down the road. To be invited to do a TED Talk, it’s not enough to have a good idea, you’ve got to be able to bring it, on command, with passion, and emotion. My old college professor used to say anyone can write a long story, it takes a true writer to create something short. And while he was talking about a magazine piece, the same can be said for TED. When your goal is to write or speak in a small amount of space or time, you have to articulate your thoughts precisely using an economy of words. Bill Gates, Bill Clinton and Bono have all given TED Talks, so I offer this thought, why shouldn’t there be a discussion led by you and discussing nothing but you? Who knows you, better than you? No one, that’s who. Call it your personal TED Talk. Everyone should have a TED Talk, whether you’re out hunting for a new job, or just offering polite conversation at a Super Bowl party. As a culture, we are defined by what we do as much as who we are; oh, there’s John Jones, he’s a doctor; oh, there’s Jane Jones, she’s an architect. You know the drill. So let’s say your next job, or even keeping the one you currently have, relies on being able to quickly, smartly and succinctly describe what it is you do to a total stranger, but your time is limited – think of it as an elevator speech on steroids. But instead of 18 minutes, you’ve got 180 seconds (three minutes). If nothing else, this will force you to give some structure and simplicity to what it is that you do every day at work. You’ve got less than a minute to hook your audience before the siren’s song of email lures them away, so you better be clear about what you’re selling and get to the point right away. That doesn’t mean you give it all away in the first sentence, but you can’t ramble for a minute or two and expect the audience to follow. Paint a mental picture for your audience. I am a writer. Last year, I traveled to Africa, Asia and Europe for my job – did I mention I never left my desk? Stick to what you know and the method you know how to do it. People can generally sniff out a phony. If your stories are a little too big or the outcomes a little too good, folks sense that, and they’ll dismiss you right away as lacking credibility. Practice finding your comfort zone and stay in it. The most important element of your TED Talk about you is knowing your competitive edge. How are you different than the next guy or gal in line? What are some measurables that show that you bring value to an organization? What are some of the intangibles? For example, last year a website I work with featured stories about alumni from Jordan, Ghana and the United Arab Emirates, which allowed our Facebook community to grow by 645 percent. Don’t be afraid to show your vulnerabilities. For example, I didn’t know anything about Ghana until I worked with our alumni Joe Doe and his relief efforts there. I enjoyed learning about a new culture and how what we do here in the United States has an effect on a country so far away. So consider yourself invited to do a TED Talk about yourself. Now it’s time to do your homework. Refine your topic. Practice your speech. Learn how to open up without wandering. These will all be key the next time you’re called upon to explain who you are and what you do. Life during the last five years has read a lot like a country song for Greg. Got laid off ­– got hired. Went to work, and then the new job expired. Went back on the street looking for work, but who’s going to hire somebody older than dirt? Worked the graveyard shift for a year or two, hoping against hope to find something new ­– and at long last did, working in communications for a university. Dream job is still blogger-in-residence for YourCompany.Com, but thankful every day to have a workplace to call home. Best advice: never stop believing in yourself. Check out Xogdog's blog at www.xogdog.wordpress.com/.